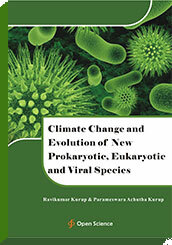 Climate change leads to evolution of new prokaryotes, eukaryotes and viral species. Global warming and the low level EMF pollution results in increased endosymbiotic archaeal growth. The archaea can induce stem cell conversion and neanderthalisation of the human species. The archaea catabolises cholesterol generating digoxin which can modulate RNA editing and magnesium deficiency resulting in reverse transcriptase inhibition. Thus archaeal overgrowth results in retroviral resistance and generation of the Neanderthal phenotype. The endosymbiotic archaea can secrete virus like RNA and DNA particles. The archaeal secreted DNA and RNA viroids can recombine with the expressed retroviral, non-retroviral elements and other genomic segments of the human chromosome generating new RNA and DNA viruses. Thus the neanderthalised humans can serve as an origin for new RNA and DNA viruses as well as mutated retroviruses. The endosymbiotic archaea converts the Neanderthal cells to stem cells. The stem cells are resistant to immune attack. The stem cells can serve as a reservoir for this new RNA and DNA viruses. Global warming and climate change leads to evolution of the three kingdoms of life.